Film Synopsis: “Tiga suku”, which literally translates into “three quarters”, is a Malay term used in the context of describing crazy, whacky or oddball-like behaviour; of being mentally “not quite there”. And “Mat Tiga Suku” is indeed an eccentric film that seeks to subvert our usual sense of logic, decorum and good taste. In this film, Mat Sentul is a poor and helpless man, lives in a house that talks to him, and daydreams about wealth and pretty princesses. It is an episodic adventure that follows the slapstick antics of Mat Sentul who, among many pranks, moves the bus-stop at his will, halts an aeroplane that does not give way, and pretends to be an office worker, a barber and a doctor. The introductory sequence of “Mat Tiga Suku” has Mat Sentul singing a catchy song in Malay, Mandarin (with a mix of Chinese dialect? ), Tamil and English. These will later become the 4 official languages of independent Singapore — Singapore was still part of Malaysia in 1964. The backing band was The Silver Strings, who also provided the background music for the film. To be able to see Mat Sentul churn out slapstick physical humour in familiar locales in Singapore is indeed exhilarating. With his genius, real places in Singapore are injected with comedic feats and they instantly transform into ridiculously dream-like and anachronistic landscapes. And Mat Sentul had enough of imaginative prowess to do this in several of his “Mat” series of movies. 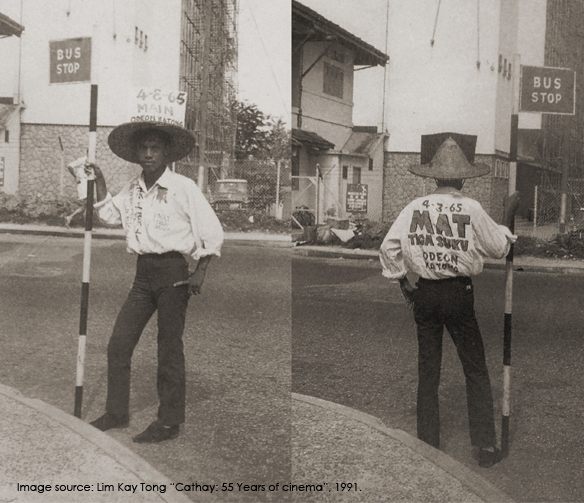 The best example from “Mat Tiga Suku” is his use of a large plot of freshly reclaimed land — the pilot site of the land reclamation project along the east coast of Singapore in the early 1960s — for a sequence where he leads a bus and a group of chasing passengers amok by moving the bus stop post at his will. It forms a strange yet funny image of a banal act of commuting by public transport gone awry in a desert by the sea. In other encounters in the film, Mat Sentul sees a mirage of a fantasy kingdom over the sea off the newly reclaimed land and flies past the Victoria Memorial Hall in a makeshift flying sleigh that comes with a “karang-guni” bulb horn. We will also get to see parts of the vicinity of the former Cathay-Keris Studios in East Coast Road — especially Jalan Buloh Perindu. “Mat Tiga Suku” is presumably a rather low-budget film and I suppose it is really out of convenience and budget constraints that many of the outdoor location shoots are completed a throw’s stone away from the studio compound. But fortunately, that doesn’t really take away the substance of Mat Sentul’s hilarity in those scenes. 1. A Typical 1950s/60s Tin-Roof Bus-stop along Upper East Coast Road. Film-stills from “Mat Tiga Suku”. In Mat Sentul’s first “adventure” of the film, he is bullied by other bus passengers and fails to board a bus run by the Katong-Bedok Bus Service Pte Ltd.
2. Pilot Site of East Coast Land Reclamation Project and Wyman’s Haven Seafront Restaurant. Near the eastern end of Upper East Coast Road. Film-stills from “Mat Tiga Suku”. Even with the bus-stop post in Mat Sentul’s hands, the Katong-Bedok No.2 bus fails to stop for him. Then, in a surreal turn of events, Mat Sentul leads the bus and a group of chasing passengers onto the newly reclaimed land off Upper East Coast Road. Mat Sentul, the bus and the chasing passengers pass the Wyman’s Haven Seafront Bungalow Restaurant on the extreme right of the collage. They then make a few meandering turns on the newly reclaimed land — the pilot site of the East Coast Reclamation Project that began in the early 1960s. Rather surreal, i must say. 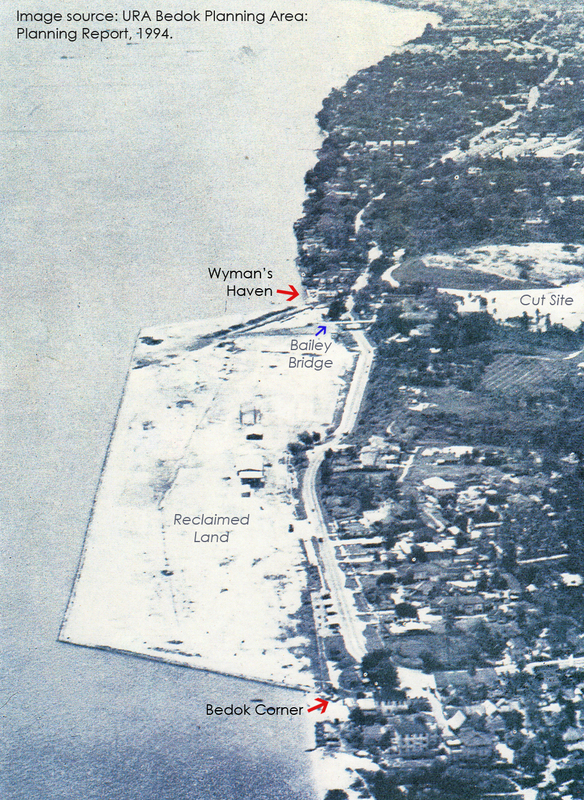 I have written a more detailed description of Wyman’s Haven in an earlier post — the seafront restaurant had also appeared in Usmar Ismail’s film “Korban Fitnah”(1959). Mat Sentul “pole-vaults” with the bus stop post in a seafront desert! A closer view of Wyman’s Haven (the cylindrical-shaped building) and the neighbouring seafront bungalows along Upper East Coast Road. Bedok Hill is in the background — it will be leveled to supply soil for further land reclamation projects after 1964. Where Mat Sentul performs his stunts with the portable bus stop is on the “Pilot Scheme” 9.4-hectare site of the East Coast Land Reclamation Project, under taken by the Housing Development Board in 1963 with the help of Japanese expertise. 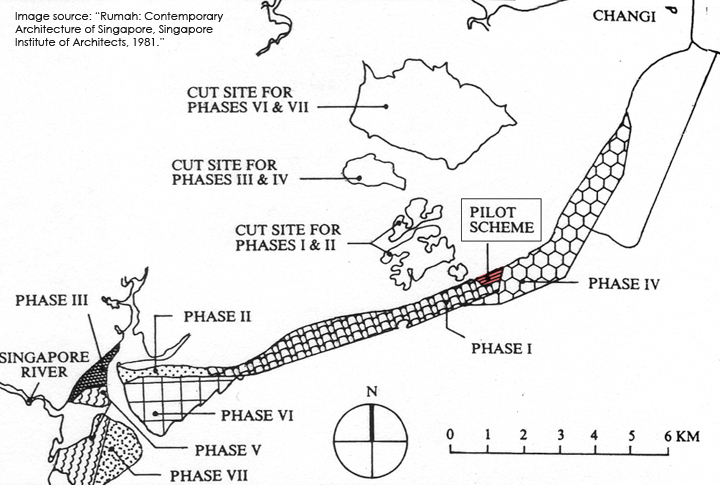 With the pilot’s success, further phases of the East Coast reclamation were implemented as presented in the map above. I would further note that the “Cut Site For Phases I & II” became the Bedok New Town of today, and “Cut Site For Phases III & IV” was transformed into Bedok Reservoir. Amazing how the lands shift in Singapore. An aerial view of the Pilot Scheme Reclaimed Land off the east coast at Bedok. Notice the “Bailey Bridge” that was used to aid the transportation of soil from the cut sites, across Upper East Coast Road, to the land reclamation sites. Another aerial view of the Pilot Scheme Reclaimed Land off the east coast at Bedok. The “white patch” on the left in the photograph is probably the cut-site for the pilot reclamation project, formerly part of the Bedok Hill. Mat Sentul continues with his crazy act, runs back past Wyman’s Haven, and onwards along Upper East Coast Road. The building on the center right of the collage is the seafront bungalow that houses Wyman’s Haven. The “black mass” in the center is a passing vehicle in the panning shot from the film. Temasek Secondary School now sits on the location where Wyman’s Haven and the west edge of the pilot land reclamation site were. Where Mat Sentul ran amok with the Katong-Bedok bus in “Mat Tiga Suku” is now the school’s synthetic grass field and the surrounding forest lands. 3. Tanah Merah Kechil Road. Mat Sentul, still playing a fool with the bus stop post, ran past a row of coconut palms along Upper East Coast Road, and makes a turn at the junction with Tanah Merah Kechil Road, with the bus and the running crowd of delirious passengers in tow. On the extreme left in the collage, the road sign reads “…… AH KECHIL RD 16”, so I surmise that the turn-off at the junction should be “Tanah Merah Kechil Road“. “16” probably refers to “District 16” in Singapore. This part of the long and winding Tanah Merah Kechil Road does not exist in the maps of today, as the hilly terrain which the road passed through had mostly been leveled for the purposes of land reclamation. The junction as depicted in the collage above is probably close to where the junction of Bedok South Avenue 3 and Upper East Coast Road is today. Notice the coconut palms on the right. Are the same palms in the film from 1964? Mat Sentul and the bus persist in this surreal excursion across the Tanah Merah Kechil landscape. This was probably shot along Tanah Merah Kechil Road, at a stretch not too far off from the Upper East Coast Rd junction. I have wondered where this dirt track named Tanah Merah Kechil Road will lead one to? Mat Sentul ended the bus-stop chasing sequence soon after the above panning shot. What if he was to continue with this prank escapade up Tanah Merah Kechil Road? What would he and the off-the-schedule “Katong-Bedok” bus encounter along the way? Chinese cemeteries? Vegetable Farms? Kampungs? Fruit tree plantations and pig farms? WWII defence installations? Japanese occupation massacre sites? What other crazy antics would Mat Sentul have come up with? An old 19th century map of Singapore. “Tannah Merah Ketchil” (labeled in the map as “Small Red Cliffs”) was the region bounded by the coast, Siglap Road and Changi Road. It was so named because early seafarers and cartographers had observed that the hills and cliffs by the east coast had their top soil removed due to erosion, thus exposing the red laterite soil underneath. 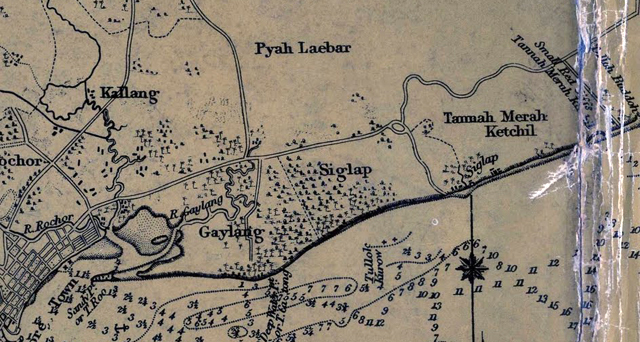 In fact, there were two regions named “Tanah Merah”, the small cliffs on the west towards Siglap were named “Tanah Merah Kechil”, the large ones on the east towards Changi Point were named “Tanah Merah Besar” (kechil – small; besar – big). 4. Pilot Site of East Coast Land Reclamation Project and Victoria Memorial Hall. Film-stills from “Mat Tiga Suku”. Mat Sentul is daydreaming again. Here, he imagines himself to be a Malay princeling who unveils the curtains of his room in the palace and is left stranded in a desert by the sea. He walks through a portal that instantly turns him into a pauper again. Through a twist of fate, an Arabian guru appears to grant him a new set of Arabian garb and a decorated wand that has magical powers. He sees a mirage of an Arabian fantasy palace over the seas and figures a way to get there. This absurd sequence was probably also shot at the above-mentioned pilot site of the East Coast Reclamation Project. It sure looks like a vast desert with an oasis in the distance. Film-stills from “Mat Tiga Suku”. Mat Sentul flies past the clock tower of the Victoria Memorial Hall on a flying sleigh that comes equipped with steering wheel and a “karang guni” bulb horn. Apparently, the clock tower is a landmark in that fantastical palace of Mat Sentul’s imagination, as he flies past it twice — on entry to the king’s room, and on exit accompanied by a beautiful princess whom he has “rescued”. They ride on that silly-looking flying sleigh as they are pursued by a gun-totting cowboy villain whom Mat Sentul has offended earlier. To end things off in this post…. photos of a walking advertisement for “Mat Tiga Suku”!